The day after an historic landslide electoral victory for the Liberal Party of Canada, we’ve compared our predictions (and those of other organizations who provide riding-level predictions) to the actual results in Toronto. Before getting to the details, we thought it important to highlight that while the methodologies of the other organizations differ, they are all based on tracking sentiments as the campaign unfolds. So, most columns in the table below will differ slightly from the one in our previous post as such sentiments change day to day. This is fundamentally different from our modelling approach, which utilizes voter and candidate characteristics, and therefore could be applied to predict the results of any campaign before it even begins. (The primary assumption here is that individual voters behave in a consistent way but vote differently from election to election as they are presented with different inputs to their decision-making calculus.) We hope the value of this is obvious. To start with, our predictions included many more close races than the others: while we predicted average margins of victory of about 10 points, the others were predicting averages well above that (ranging from around 25 to 30 points). The actual results fell in between at around 20 points. Looking at specific races, we did better than the others at predicting close races in York Centre and Parkdale-High Park, where the majority predicted strong Liberal wins. Further, while everyone was wrong in Toronto-Danforth (which went Liberal by only around 1,000 votes), we predicted the smallest margin of victory for the NDP. 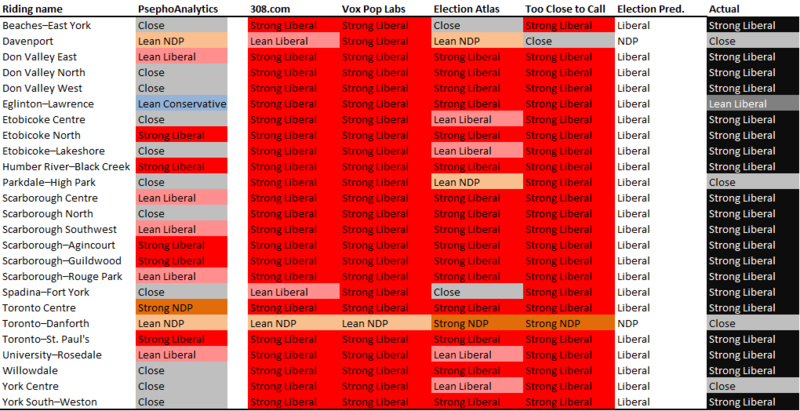 On top of that, we were as good as the others in six ridings, meaning that we were at least as good as poll tracking in 9 out of 25 ridings (and would have been 79 days ago, before the campaign started, despite the polls changing up until the day before the election). But that means we did worse in the others ridings, particularly Toronto Centre (where our model was way off), and a handful of races that the model said would be close but ended up being strong Liberal wins. While we need to undertake much more detailed analysis (once Elections Canada releases such details), the “surprise” in many of these cases was the extent to which voters, who might normally vote NDP, chose to vote Liberal this time around (likely a coalescence of “anti-Harper” sentiment). A natural cycle in Canadian federal elections?